Udo’s Choice Super 8 Microbiotics Hi-Count contains 8 bacterial strains designed specifically with a higher percentage and concentration of L. acidophilus. Poor diet or health, antibiotics or simply the stresses and strains of modern living can disturb the delicate microfloral environment in the digestive tract, which can be detrimental to health in all kinds of ways. 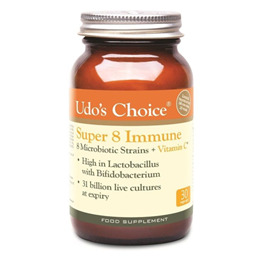 Udos Choice Super 8 Hi-Count combats this effect by replenishing gut bacteria. In fact, it’s one of the most efficient supplements of this type available. It contains 8 bacteria strains which are found in both the small and large intestines, lacto in the small and bifido in the large. By including strains from both families, Hi-Count Super 8 ensures that your entire digestive system is covered. Why Udo`s Choice Super 8 Hi-Count? Compared to microbiotic yoghurts, rebalancing with Super 8 is faster, cheaper and of course, sugar free. To look after yourself, start by looking after that incredible ecosystem in your digestive tract. The specific strains used in Udo’s Choice Super 8 Hi-Count Microbiotics have been specially chosen for their value to upper bowel health and have been formulated to the appropriate viable count. Each vegetarian capsule contains: 42 billion viable cells at time of manufacture and at least 31 billion viable cells at expiry in a base of potato starch, ascorbic acid, stearic acid, and silicon dioxide. The Udo’s Choice range of Microbiotics provide the whole family with bacteria for their gut. From new born infants to grandparents, there is a formula that Udo Erasmus has created to best serve the gut flora appropriate to each age group. Take a look at our Udo’s Choice Ultimate Oil Blend and Udo’s Choice Beyond Greens to find out more about the benefits Udo’s Choice products have to offer. Lactobacillus acidophilus (HA-122) : 45%, Lactobacillus rhamnosus (HA-111) : 25%, Lactobacillus rhamnosus (HA-114) : 10%, Lactobacillus plantarum (HA-119) : 7%, Bifidobacterium bifidum (HA-132) : 6%, Lactobacillus casei (HA-108) : 3%, Bifidobacterium longum (HA-135) : 3%, Lactobacillus salivarius (HA-118) : 1%, potato starch, ascorbic acid, stearic acid, and silicon dioxide. Capsule: Hypromellose. Super 8 may be frozen. Refrigeration ensures maximum potency and stability however; Super 8 can be left unrefrigerated for short periods of time, making it convenient for travel. We keep all our Udo’s Choice probiotic products in the freezer and send out frozen to ensure optimum activity when the product reaches you. All Udo’s Choice probiotics are over-filled to allow for a period of time, up to 72 hours, in transit out of refrigeration. You can also freeze them at home to prolong the activity of the product for up to 2 years. The re-frozen and thawing process should not affect the potency of the product negatively. Below are reviews of Udos Choice Super 8 Microbiotics Blend - 30 Vegicaps by bodykind customers. If you have tried this product we'd love to hear what you think so please leave a review. Great probiotic at a great price. I needed a stronger one than I might have usually used and I definitely feel the benefit from this one! Highly recommend this seller. Products always arrive promptly, packaged well and with no issues. Arrived promptly. Brilliant product, within a week cured bloating and constipation. Would certainly recommend. Arrived swiftly and bottle was packaged well making it retain its refrigeration. I have used for 2 weeks now and are making some difference. I will keep taking for sure. Really pleased with item, great for gut, this was a changed brand from my normal one and very happy with it so far, can't remember last time I was bloated or constipated. Great company to deal with. They do the job very well. I used these and within a week I was without any constipation. I forgot the name and used a recommended product which was a complete waste of money. Tracked down these again and am a happy bunny again. Absolutely fabulous product. This is one of the best probiotics around, works very well for me. Excellent packaging and fast delivery. Strong glass container keeps the tablets cool. Very good value compared to other web sites. Highly recommended. Very good product supported by excellent customer service, etc. Not the cheapest probiotic but by far the best in my opinion. Expensive but they seem to be the best. Used them to restore healthy bacteria in the gut after an upset. Soon restored everything to normal. The counts stated certainly seem to be the highest available. Excellent delivery and an excellent product. Purchased this after I became pregnant and developed oral thrush and bloating. Have had 2 bottles already. Has helped to relieve the bloating, although thrush has not completely cleared. Might possibly need to take for a longer period. Was delivered in time given. As far as can be ascertained the product does what it is supposed to. Excellent. Had been ill and had to take two lots of antibiotics and was really tired. These probiotics gave me more energy. I would highly recommend them. These make so much difference to my gut health, less bloating and the associated gas! Worth every penny and wouldn't order from anywhere else, fast delivery and excellent customer service. Not any better than other similar products but rather more expensive. I had ulcerated colitis three years ago and after a nutritional expert advised I should take them to obtain a normal colon, I started taking them and would not be without them now. Improved my bowel movements, and my health. Two weeks in and really found a difference. I am able to eat and digest food much better. No constipation which was a problem before. Less IBS an overall improvement already. I am impressed. Thank you. As always arrived cold and quickly. Brilliant product. Definitely the best probiotics I have used after trying other variations from America to combat chronic constipation. Since taking these for gut issues they have cleared up quickly. An important gut is vital for good health! I trust Udos products. These cleared up my son's Rosacea in just a week, when doctor's steroid cream just made it worse. He's never suffered since. Have used these a few times now! Really helps with Gut health. Trust Udo's Choice products. As a result of taking this product, an open sore on my back is healing, Hooray! I’ve tried many friendly bacteria products and this has been the most effective. Excellent product which I have been consuming for a while. Quite pricey but keeps the gut in good condition. Excellent service as always. Completely no exaggeration have transformed my daily life! I was diagnosed with re-aucurring urine infections last summer after having a urine infection 1-2 times a month which affected work, relationships, my whole life it was a nightmare. The doctors told me the only so 'cure' were antibiotics so that means up to 24 courses of antibiotics per year. However my personal trainer at my gym recommended these all natural probiotics and since taking them for 8 months I no longer suffer from infections. I did run out of these 2 months ago and a week after I stopped taking them, I got an infection so that just proved to me these are my cure! Please give these a try if you are thinking about it as once they start to work you will be amazed. Can't recommend enough and wish all doctors knew about these. Love this product. Have only been taking it for 2 weeks but I can already tell that it is working. Every time I take a tablet I become a lot hungrier as a result of the digestive system working much faster. I good product if you just want to kick start your metabolism and improve your guts. I would highly recommend this product. These are fabulous probiotics. Well worth the hefty price tag. Any company declaring their strains (different to species) knows what they're doing with probiotics, which Udo's certainly does. A very generous spore count also - 42 billion per capsule. I haven't found any others this high. Also Bodykind informed me that they freeze all their probiotics so you can be confident that they have been well treated and should be as close to the stated spore count as possible when you receive them. Many retailers do not treat their probiotics well. These probiotics have really helped my gut health. I suffered from frequent constipation before trying these. Not any more. I will continue to take these. Previous to taking these probiotics I suffered from various gut issues. 1 week into taking these and they were gone! Question about Udos Choice Super 8 Microbiotics Blend - 60 Vegicaps Does this taste as good as Udos Oil? As it's in a vegicap and swallowed with water, we don't feel you can taste much Udos to be honest. Question about Udos Choice Super 8 Microbiotics Blend - 30 Vegicaps How long can you keep taking super 8 for? 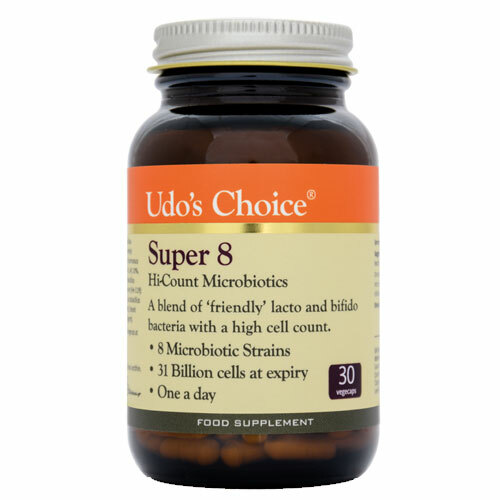 Udo's Choice Super 8 is an effective probiotic that can be taken on a daily basis as part of a healthy regime to make sure your digestive system is always populated with the friendly bacteria it needs to stay healthy. It is safe to take every day over long periods.